In Santa Barbara’s Church of Scientology, as in each such outpost worldwide, an innocuous office sits equipped but vacant. This office is located beyond shelves of shrink-wrapped books, beyond training rooms, the “comm” rooms, and a room occupied by enigmatic bowls of stones and other obscure objects. The office, with white walls and plush blue-and-gray carpeting, waits, should he somehow return, for the man once known as L. Ron Hubbard. His full name was Lafayette Ronald Hubbard. His followers—in keeping with their love of acronyms and meaning-imbued abbreviations— know him as LRH. However it’s said, his name is known worldwide mostly because he plastered it in large capital letters on everything he wrote, totaling millions of words in all. He lectured and wrote extensively, purportedly until the day he died, as he created and grew what is arguably the most controversial religion in recent history. In Hubbard’s own words, he “discovered” Scientology and its backbone, Dianetics. Yet it hasn’t been as easy to discover Hubbard, to wade through the legend to uncover the man. A call came over his radio at about 7:30 a.m. It wasn’t overtly mysterious, just peculiar. Someone from the Reis Family Mortuary in San Luis Obispo made an apprehensive call to the Sheriff’s Department. That morning the chapel was contacted and informed there was a body that was to be gathered and cremated immediately, although the man died a day earlier. Gassett and Bang were told to make sure there was no foul play. The name didn’t register at first, Gassett said, but his partner knew exactly who they were going to see: L. Ron Hubbard had been living just north of San Luis Obispo, but two deputies inadvertently would be the first people outside the church to learn of it. THE RANCH : The ranch in Creston where L. Ron Hubbard spent his last years is still perfectly maintained after 23 years. It’s owned by the Church of Spiritual Technology, a branch of Scientology, and church symbols mark everything from the horse racing track to the front gates. Hubbard’s ranch, now owned by a Scientology offshoot, is the most manicured property in the area. On that morning, the wheels of a sheriff’s patrol car rolled off the asphalt of O’Donovan Road and crunched over the dirt and gravel driveway leading past other ranches to Hubbard’s secluded 160 acres. A perfect white fence borders the ranch. Thick green grass lines the way. Horses, cattle, and sheep still amble and graze. Back then there were also llamas and buffalo roaming freely. Gassett and Bang arrived at the ranch where they were met by Hubbard’s attorney, Earle Cooley, and his doctor, Gene Denk. They were led past the southwestern-style house and behind the stables to a 1982 Bluebird motor home. Both remembered it was a pleasant day, but the air conditioner was running inside. Hubbard’s body was unattended. The man they saw was unrecognizable from the image of a spry young writer Hubbard had pasted on so many of his book jackets. His body lay in bed with the covers drawn to its chest. His hairline was receded but his mane had been grown long over the back of the neck. Hubbard’s remains were slim with long, unkempt fingernails and toenails. His hands were folded on the chest, Gassett remembered. Bang knew of Hubbard because he, like many others, had bought Scientology’s equivalent of the Bible: Dianetics: The Modern Science of Mental Health. The book was advertised as a powerful answer to life’s problems, so Bang decided to give it a try. He hadn’t read the first page, however, and after coming face to face with the author, he never did. They gave the body a quick examination but saw nothing out of the ordinary. Hubbard had suffered a stroke a week prior. His cause of death was determined to be a “cerebral vascular accident,” according to the coroner’s report. The deputies then went and waited with Cooley and Denk for someone from the funeral home to arrive. “They told us a little bit about who he had been,” Gassett said. “He had been living up at the ranch for a couple of years and he had grown his hair long and basically had blended in with the general population and nobody knew him up here by sight. He could come and go in town as he pleased.” According to news articles and church statements, Hubbard used to drive his motor home around frequently, often spending the day in Paso Robles or San Luis Obispo. HOLLYWOOD HUBBARD : The famous Scientology Celebrity Centre in downtown Los Angeles is known for visits by Tom Cruise, John Travolta, and Kristy Alley. The message from Cooley and Denk was clear that Hubbard was to be cremated immediately. Hubbard had drafted a new will that stated there would not be an autopsy because it violated his religious beliefs. The will was signed, dated, and imprinted with Hubbard’s inked thumbprint. The new will, giving more assets to his family than a previous version, was dated the day before he died. At the time he was worth about $25 million. • Hubbard’s blood contained traces of Hydroxyzine, also known as Vistaril. The last detail has proven difficult for his followers to reconcile. Hubbard disdained “psychs” and their medications. In internal writings to Scientologists he often described psychiatrists as criminals and con artists who knew they could not cure mental illnesses. Scientologists are not against all prescribed medications, only the psychiatric variety. According to the church, Hubbard suffered allergies from the animals he kept on the ranch and was prescribed Vistaril as an antihistamine. The drug, however, has another use. According to the Food and Drug Administration, Vistaril in both the capsule and injected form is used for relief of anxiety and tension associated with psychoneurosis. No longer needing his body and unencumbered by its limits, Miscavige explained, Hubbard could continue to research more advanced levels of Scientology: Operating Thetan, referred to as the OT levels. The crowd broke into raucous applause. As with other aspects of Hubbard’s legend, there are two explanations why he chose to write his final chapters in SLO County. Despite the implication of Miscavige’s speech, Hubbard was not a god, a prophet, or a deity, Davis said. He was just a man, but church members rarely focus on his flaws. According to the church, by 1980 Hubbard had fled the spotlight he had created to continue his writing and research in private. He went first to Newport Beach and then SLO County, occasionally emerging to present a new church policy, written lecture, novel, and sometimes his own music (a new style dubbed “space jazz”). Hubbard moved to Creston in 1983. He spent his remaining years writing fiction and researching Scientology. Church representatives said he wrote enough material during six years of seclusion to fill three file cabinets. Those works included the science-fiction novel Battlefield Earth and the 10-volume series Mission Earth, which he completed while in Creston. He wrote lyrics and composed music for the soundtrack to Battlefield Earth. He also wrote the album The Road to Freedom, in which he sang the final track “L’Envoi Thank You for Listening,” which is the only known recording of his musical voice. The complete album was released shortly after his death. During his seclusion in Creston, Hubbard also established his literary agency Author Services Inc., which published many of his works. His seclusion seemed to have been a creative spark for many of the writings for which he is now famous. But there may have been another reason for that isolation besides inspiration. After news of Hubbard’s death surfaced, Bang said, agents from the U.S. Department of Treasury and the Internal Revenue Service called the Sheriff’s Department because even they did not know where to find Hubbard. They had been looking for him. 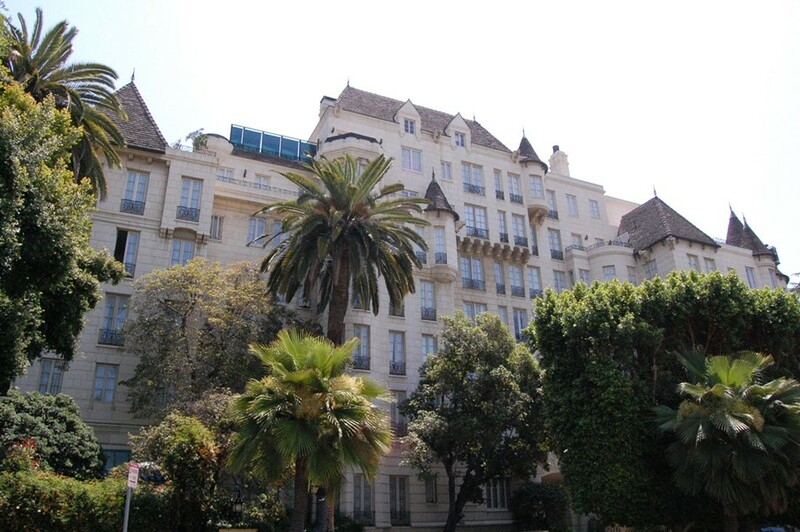 Hubbard’s estate was so enormous in large part because of an explicit premise in Scientology that adherents must to pay to progress in the church. A 1978 Los Angeles Times story describes a series of FBI raids on Scientology churches that led to the indictment of 11 people, including Hubbard’s wife, Mary Sue. They each received 5-year prison sentences. Hubbard escaped prosecution as an “unindicted co-conspirator.” According to the Times, the raids, called operation “Snow White,” came after it was learned Scientologists had infiltrated federal offices, leaked stories about perceived enemies, and copied federal documents about the church. HUBBARD ON SALE : The Santa Barbara Church of Scientology is more of an L. Ron Hubbard shrine, with shelves full of his books and lectures. Newspapers did report Hubbard’s death and final whereabouts but the Challenger space shuttle exploded days later and diverted media attention. The Telegram-Tribune ran a front-page story documenting a full tour of the ranch about a week after Hubbard’s death. A Scientology spokesman named Vaughn Young led the tour; he was writing Hubbard’s biography, which was never finished. At that time Young was a high-ranking spokesman for the church but not even Young knew where Hubbard was until after he died. After the death, Young was called to Creston to handle the press, despite having little first-hand knowledge of Hubbard’s last years. This is according to Young’s accounts, which became available three years after Hubbard died when Young fled the church with his wife Stacy. A church statement provided by Davis stated Young was demoted in 1987 and left soon after. Earlier in the same decade Young was defending the church and blasting its critics. By 1989, Young’s sentiments had changed: Scientology became a cult, he said; Hubbard’s writings were doublespeak; and Hubbard himself was like “Big Brother” from Orwell’s 1984. After leaving the church, Young changed his name and became known as Robert Vaughn Young. He wrote extensively and published online scathing accounts of Hubbard’s life and death, which he believed was the result of foul play. In 2003 Young died of cancer. He and his wife had divorced, but he had remarried. The Scientology version of Hubbard’s life recounts him as a young boy in Nebraska. He became the youngest Eagle Scout in history and later circumnavigated the globe researching the religion and philosophies of other cultures. He went on to study at George Washington University, and eventually joined the Navy where he rose to the rank of lieutenant and became a highly decorated officer. He was crippled and blinded in battle. In a military hospital, surrounded by other wounded service-men, Hubbard began the early research in Dianetics, which he used to heal himself and help his fellow soldiers heal themselves, too. There are other, less flattering, details. He left the university after two years and never graduated (Davis said he admitted this during lectures). Hubbard did rise through the naval ranks, but was also disciplined on several occasions for his decision-making and leadership skills, according to military records. Before he wrote Dianetics, Hubbard was in the hospital for an ulcer, not war injuries, according to military documents. “This is the process by which a second but false set of records is created for intelligence personnel to intentionally disguise certain aspects of their records ... ,” he said in a statement. 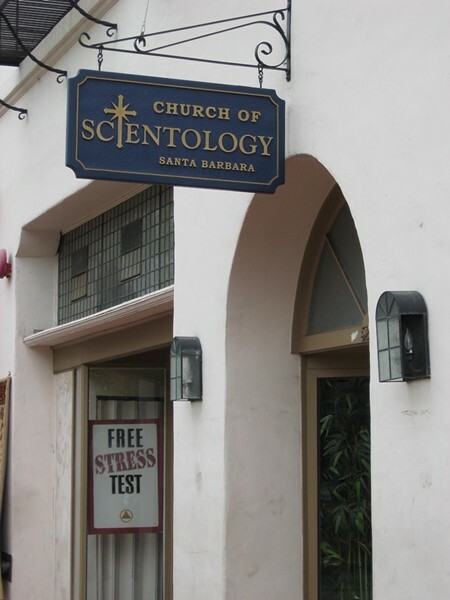 SUNDAY SERVICE : Santa Barbara’s Church of Scientology is the facility the closest to Hubbard’s ranch in Creston. Many people claim to have been saved by Dianetics and the later works of Scientology, but the book, first published on May 9, 1950, was also a savior for its author. Before Scientology, Hubbard was known strictly for his pulp fiction. He dabbled in short stories in such literary magazines as Dime Adventure Magazine and Thrilling Adventures in the 1930s and early 40s. 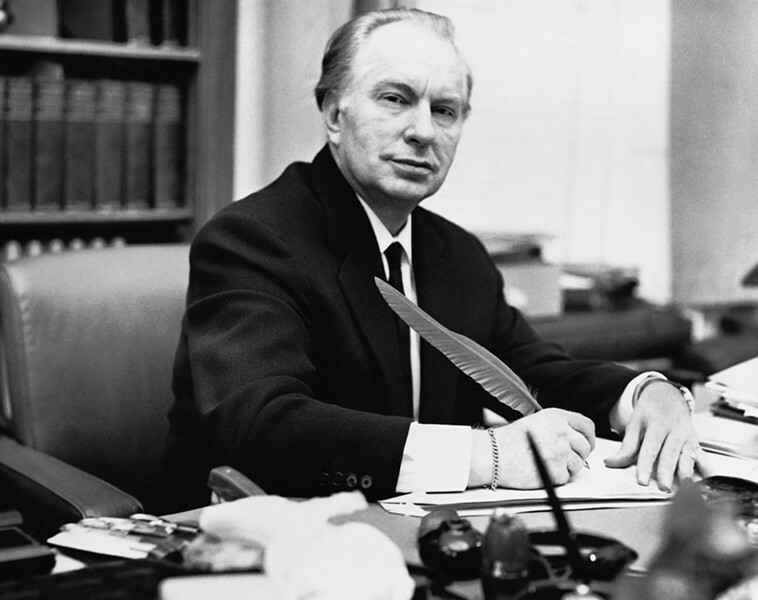 Dianetics propelled him from fiction writer to healer. 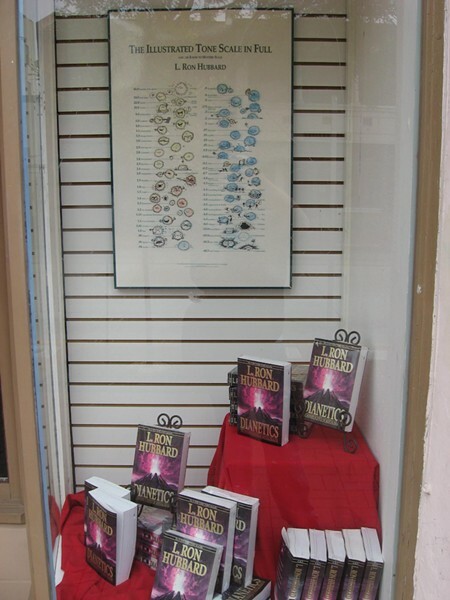 The book, which stayed on the New York Times bestseller list for 26 weeks, is still the cornerstone of Scientology. Hubbard later wrote 18 other bestsellers on Dianetics and Scientology. An illustration of an erupting volcano is pictured on the cover and is still a recognized image of the church. Dianetics can most easily be described as a pseudo-Freudian method to rid people of mental pain. Never does Hubbard present the concepts as theories. To him, this was scientific fact. (Scientologists use Hubbard’s invention called an electro-psychometer, or “e-meter.” It measures small electrical impulses during intense personal interviews to help an “auditor” uncover “engrams” in the interviewee). In the early pages of the book there is constant referral to a woman being beaten unconscious and her ensuing psychosomatic injuries stored as “engrams” in her spirit. Near the time of his death, the IRS estimated Hubbard’s estate and church assets at about $26 million. The church and all its branches have yo-yoed with the IRS, first gaining a tax-exempt status, then losing it in 1967, then appealing over several decades. The church was again granted a tax-exempt status in 1993, which it has continued to hold. When Hubbard was living on the Creston ranch he was no longer the official church leader. He had stepped down from his corporate position in 1966. According to county assessor documents, the ranch has been assessed at about $1.5 million. Hubbard’s name, however, never appeared on any county-held document for the ranch. Nor has there ever been direct mention of the Church of Scientology. The church is a complicated set of many organizations dedicated to various functions from archiving and publishing Hubbard’s works to producing promotional materials in a multimillion-dollar studio near the city of Hemet. In July 1983, the ranch was deeded to Thomas O’Brien, who held no special church position. The property stayed under that name until shortly after Hubbard died. In February of 1986, the ranch was given to Norman Starkey. Starkey was listed as a trustee in the Authors Family Trust-B. The trust is the financial arm of Hubbard’s literary agency, Author Services Inc., based in Hollywood. It wasn’t until 1993 (the year the church became tax exempt) that the deed was transferred to the Church of Spiritual Technology, a branch of Scientology. The ranch is still under the ownership of the Church of Spiritual Technology, or CST. CST is a branch of Scientology dedicated to preserving Hubbard’s works and maintaining his estate. There are many such properties, including one in New Mexico, which a Los Angeles Times report says has an underground chamber where Hubbard’s materials are stored. A reporter’s recent visit to the ranch in hopes of a tour was met with close supervision and a seemingly choreographed response that eventually led to a young woman who arrived by golf cart. She was young, pretty, possibly in her mid-20s, wearing a blue shirt and black pants. She said she’s a caretaker on the ranch and lives with her husband and other caretakers, although she didn’t say exactly how many. They weren’t ready for tours, she said, maybe in a few weeks. It’s perfectly maintained, right down to the CST symbol engraved in Hubbard’s horse racing track, which can only be seen from an aerial view. There’s something very tranquil about the ranch, even from the outside. By most accounts, it’s almost exactly the same today as it was when Hubbard lived there. The Road to Freedom album, which Hubbard wrote while in Creston, was released two months after he died. His lyrics are both a boastful praise of Scientology and a goading challenge to those who don’t believe. Perhaps Hubbard the man can be best surmised in the final lines of the final track. His deep baritone voice breaks through the upbeat horn sections and heavy electric drums.